I am beyond proud of this project. I love how it’s colorful. I love that it’s made out a felt. And I love that I took the extra time to make this banner sturdy—with the hopes that it not only survive one child but could possibly be passed down for the use of a second or a third. The idea was provided by the customer. Her son thrived under a routine, and she found that their days progressed better when he understood, to a point, what to expect. 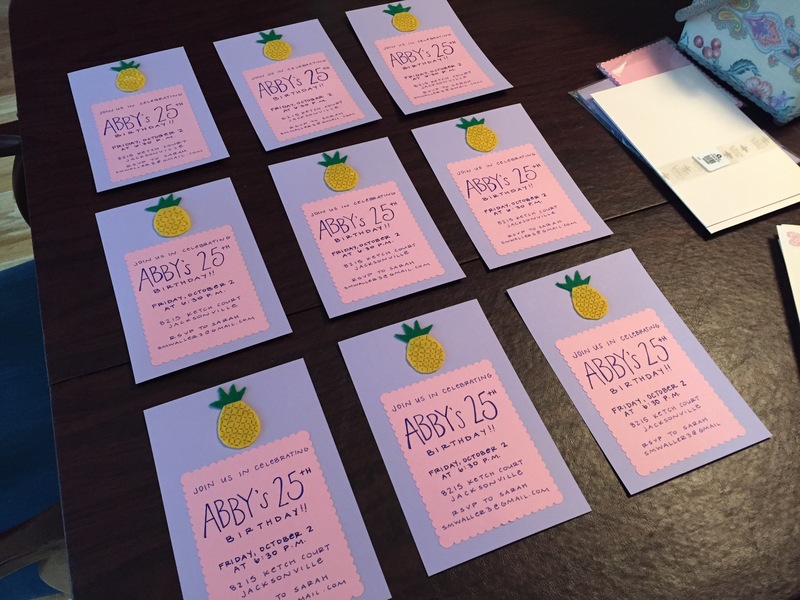 She provided the individual prompts—signs for lunch, playtime, bedtime, snack, etc. We made sure there were enough signs to make it through the hours of the days, plus extras… because obviously, you need some variation within the week. She asked for the day to start at 7 and end at 7, and then I came up with the rest from there. The trick was trying to figure out how to visualize 13 hours on a banner without making it enormous. Though the problem quickly resolved itself when I realized I would need to create some sort of pocket to store the little signs. I created two columns with seven panels each. Before finishing the banner—using quilting techniques like binding—I attached magnet snaps to the banner along with the signs. Since felt is a soft fabric, I worried that the act of pulling the signs off the banner each day would quickly wear on the fabric, so I made sure each magnet had a backing of thick cardboard. I designed the banner so it could be hung on the wall and easily used by a child. Plus, I just wanted it to look good. Knowing it was for a boy, I used lots of blues and greens. But you could easily use different color palettes, like purple and blue, yellow and navy, pink and more pink! All of the signs were hand sewn, but I did use a sewing machine for the banner. … Yeah, I definitely should have sold this for four times the price I charged. Oh well. It’s been a year and a half since I logged into this WordPress site, and this great hiatus is not because I’ve stopped crafting. Goodness, no. But instead, I let this project that once brought me tremendous joy sail away with other seasonal life interests. I could blame the busyness of work or that I’m now taking graduate classes at night. But in truth, I think the joy that led me to create this blog began to fade a year and a half ago, making a fun side hobby feel more like work. Well, as some people say, never throw anything away because its bound to come back in style. Over the Christmas break, I was inspired to read through the countless blog posts I have here. Of course, it’s a little embarrassing to see how many spelling and grammatical errors exist (and I’m sure there are a few in this post too), but the walk down memory lane was fun. At the same time, I was creating felt stocking for my parents, using patterns/kits by Bucilla. Christmas was a little different this year for my family. My mother was recently diagnosed with cancer, and two weeks before Christmas, she underwent a very intensive surgery that caused an extended hospital stay. My parents live in Georgia; I live in Alabama. So for several weeks, I made the trip back and forth. As I’ve said on this blog before, my mother has the best advice, and her crème de la crème is this: Know what makes you happy, so when times turn sad, you have tools you can use to lift yourself up. My greatest tool is crafting and sewing… and a whole of prayer. I can’t remember when the idea came to me, but I know this project of creating felt stockings was one of the greatest blessings during this difficult time. Not only did the kits throughly entertain me during a time where there was a lot of sitting around, but they able gave me a focused line of thought on something positive and beautiful. I finished my dad’s stocking before the surgery, and I worked on my mom’s throughout her recovery in the hospital. Once it was finished, I was able to hang it on her wall, adding a bit of Christmas decoration to her small hospital room. And I will note: the kits were amazing portable. I utilized small jars to organize the beads and sequins, using a magnet on the underside of the lids to store the sewing needles. I was able to contain everything I needed in a single freezer zip lock bag, so no matter where I was—siting at my craft table, the floor of a waiting room, the chair in the hospital room, etc.—I was able to work on it. Mom ended up leaving the hospital on Christmas afternoon, and in the following days, we opened presents and tried our best to celebrate a normal holiday season. The new stockings for Mom and Dad hung on the mantle with the felt stockings Mom made for me and my brothers when we were born. I’ve been writing a lot about this season I just experienced, mainly in Word documents that one day may see the light of day. In doing so, I felt the joy that I once had for this blog rising back up with in. So here I am, back for reading pleasure. The good news is, I have a lot of content from the past year and a half that I can share with you. I hope you enjoy. I firmly believe that one’s 25th birthday should be celebrated in a big way. Not only does 25 years mark a quarter of a century, but I see it as an important mile marker in the transition into “adult.” Postgrad life can be tough learning how to handle big-time jobs, real-life bills and grown up relationships. By turning 25, you have a couple of these years under your belt, and you’re no longer considered a rookie. So when I made plans to visit my best friend in Florida for her birthday celebration weekend, I knew a party had to be planned. First stop, the invitations! I wanted to pick a theme for the party – mainly for the decorations – that was simple. The party is going to be a casual event with friends: dinner, cake and a few games. I wouldn’t be surprised if after dinner we simply sit around, tell stories and laugh. 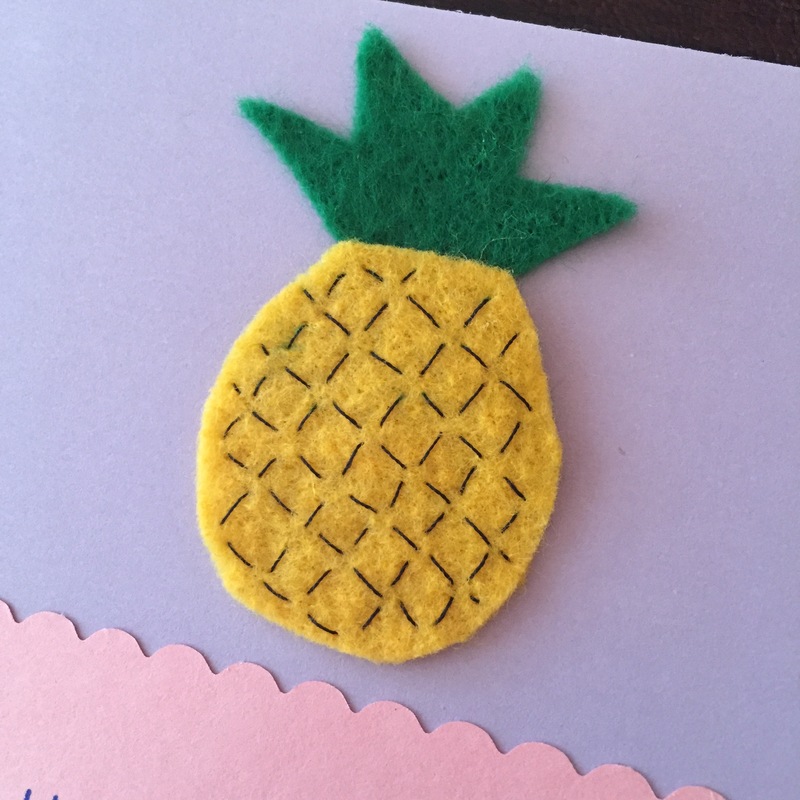 So I decided to pick a simple icon that would stand as the theme of the party, and I selected the pineapple. 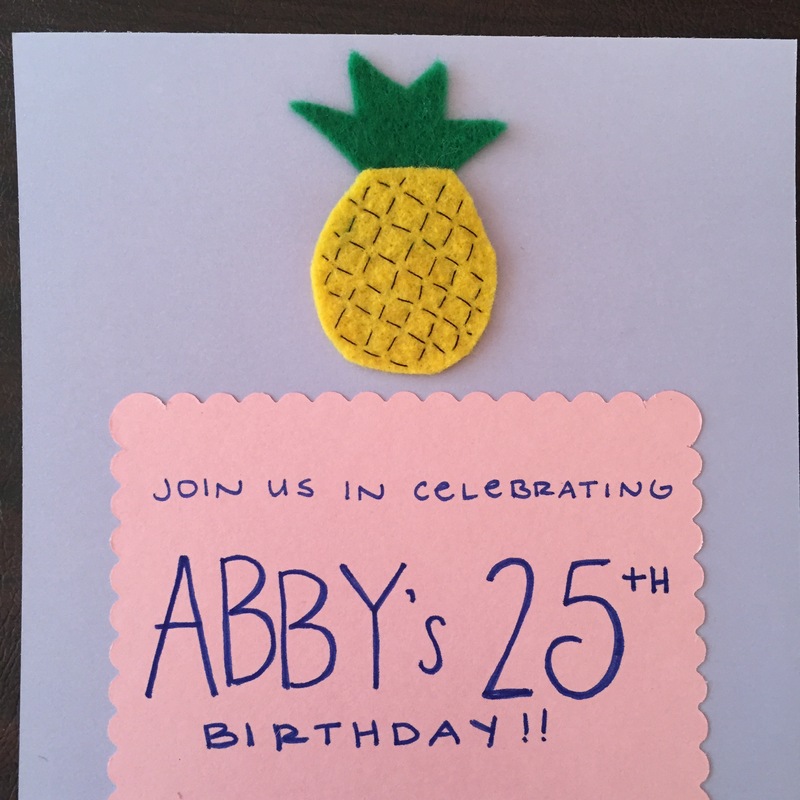 For the invitations, I made flat, felt pineapples to place like a letterhead. 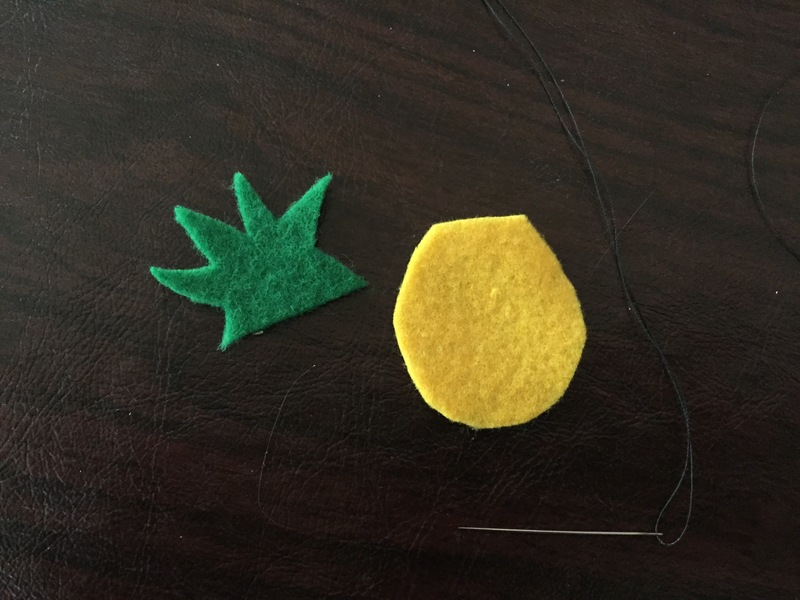 I cut out the two pieces of felt by hand, and then using black thread, I stitched the design (as well as attached the two pieces together). Once complete, I used Elmer’s glue to glue the felt piece to the card stock. I bought the card stock at Paper Source, and simply wrote out the information by hand. I’m so happy with how it all turned out. Now with these in the mail, it’s time to plan a party!